Last week after much anticipation and watching the local “yard sale” website, this joined our happy little family. Our little guy, Cooter, was beyond excitement. He had no idea that I had finally found the one, and when he saw it, well–it was totally worth it. And it was quite the bargain as well. 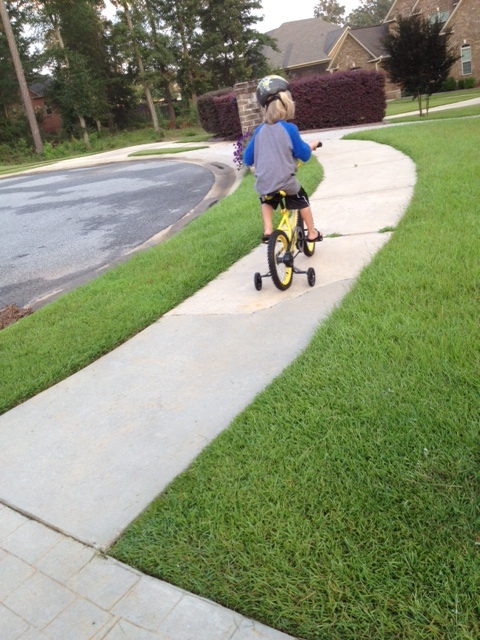 He put on the cool helmet that came with it and took off. 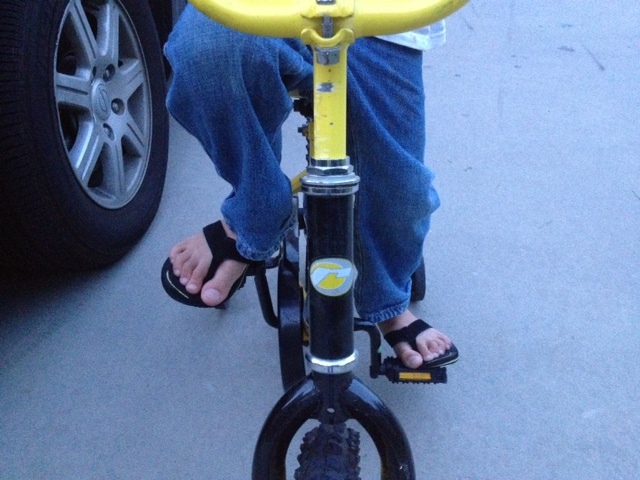 I was surprised at how well he did, considering that for the past couple of years he’s only ridden his Big Wheel . Only as he took the curve the bike wobbled and he fell over and this happened. Poor little guy. We went from best day ever to the worst. thing. that. ever. happened. He was so pitiful. And in soooo much pain. The red stuff made it worse, I’m pretty sure. So the next day, after Leroy came over and lowered the seat and tweaked the training wheels, Cooter set off again, and this time my boy was prepared. No comments please about the foot safety and lack thereof with the whole flip flop thing going on. Ahem. I’m actually surprised he was wearing shoes at all. Not that I care too much. By the third child, I find that my standards have relaxed. A lot. We all go “butterfeety” around here. But I digress. The jeans. His choice. To protect his knees. I was impressed. He saw a problem, and he problem solved. But he didn’t give up riding because of the fall. Seems like there’s a lesson in there somewhere. It reminded me of when I was in first grade. I was learning to ride my bike without training wheels. My bike was a beautiful red one that my cousin had graciously passed down to me. I thought it was all the more awesome because he was pretty cool. And I was bound and determined to ride it. Without training wheels. The road to my Granny’s house. It hasn’t changed that much in all these years. At least as I can recall. Daddy drove me and my bike over to my Granny’s which was maybe a half hour from our house. 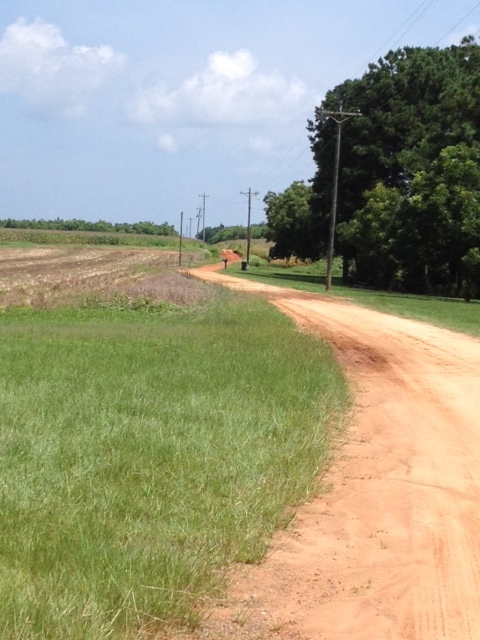 She lived at the end of a long and winding red dirt road, which now carries our family name. Daddy pulled over to the side of the road, let me out, and pulled my bike out as well. He set me to riding and sent me on my way. I think at some point he passed me and went on up to the house. I was riding along, free as the wind. That feeling of being on my own, pumping those pedals, careening along, utility poles flying by as I rode past–there’s nothing like it. And then I caught a glimpse of her mailbox. Not much further now. And I made the curve turning towards the house like a champ. There was Daddy and Granny waiting. I was so proud and thrilled and full to bustin’. And then as her porch steps grew closer and closer, I realized something very important. I couldn’t remember how to stop. 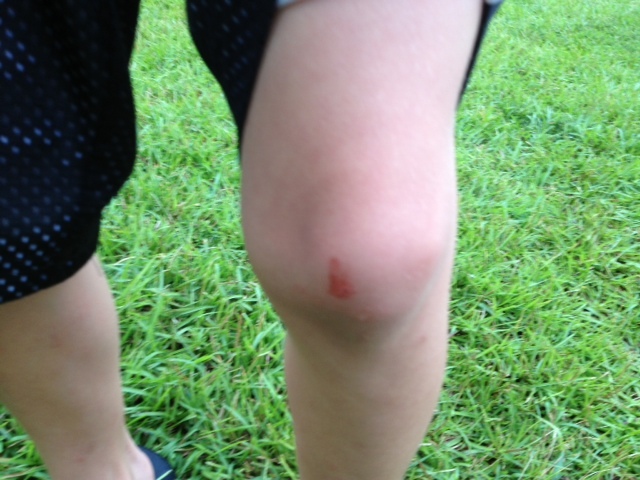 And, unfortunately my knees caught the brunt of Granny’s steps making the stop for me. That little booboo in the picture above? Nothing compared to my knees people. It was ugly. Fortunately Granny had the right medicine to make it all better. Mercurochrome and a big glass of Coca-Cola. We all sat on those steps together while I sipped and heard what a good job I’d done right up to that point. Fixed me up just right. Until a few days later when, filled with joyful glee over a day going well, I decided to skip down the catwalk at school on the way to run an errand for my first grade teacher. I skipped and tripped and opened those knees back up. The worst hit was on my heart because skipping was not allowed on the catwalk. I just knew I was in trouble. And yet somehow it all turned out all right. My heart. My knees. And only a small scar or two to help me remember that day. Of that first time without any help, riding along, on my jazzy red bike that was a gift from my cousin. And sitting with my Granny and Daddy, two of my all-time favorite folks. Then there’s the Coca-Cola of course. Good memories, good times. 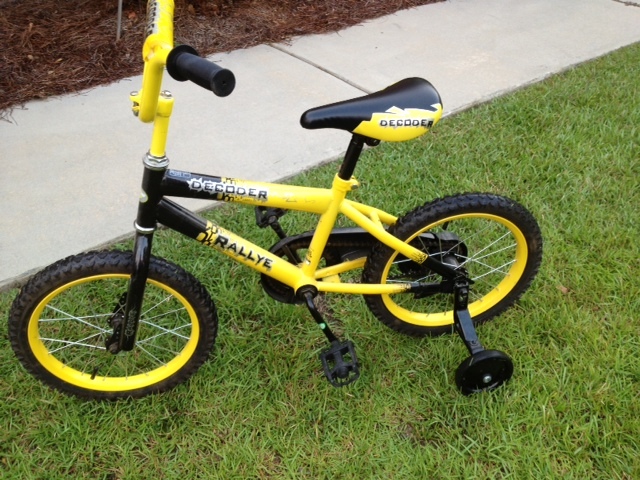 I hope one day Cooter will have some cool stories to share of his adventures on his awesome yellow bicycle. As I watch him sleeping tonight, it occurs to me that I’ve bought my last bike with training wheels, and that this is the bike that he will have his first independent adventure on. Sigh. I know that in this life he will fall down, but I hope there will always be someone to listen to his hurts and encourage him to try again and cheer him on when he does. Most of all, I hope he will always have the spirit and strength to try again, no matter how many times he falls. And if it takes a little Coca-Cola to help boost that spirit, well, that’s okay too. Now off to find a bottle of Mercurochrome to keep handy. I’ve got a feeling we’re going to need it.